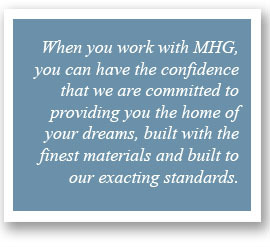 At MHG, we know that one of the most important stages of our relationship is after you move into your new home. We stand behind our work and provide a comprehensive warranty program. MHG is committed to customer satisfaction, and we have achieved extraordinary homeowner loyalty with a history of low warranty claims. We will go the extra mile for you, ensuring that all facets of your new home meet your expectations and our standards. Before you move-in, each homeowner receives a new home owner orientation walk-through that is designed to familiarize you with your new home. At closing, homeowners are also given a new homeowner binder that contains all of your product literature and extended warranties for items such as appliances and the HVAC systems. MHG professionals will review our warranty program with you prior to the start of construction and again at the final walk-through. Greater Atlanta Home Builders Association (GAHBA) Homeowner Handbook and Limited Warranty. This one-year limited warranty covers materials and workmanship as well as mechanical issues. The GAHBA Handbook also serves as a new home buyer’s resource guide to home maintenance and care. It details useful and simple steps in preserving, protecting, and maintaining your new home. You will receive a copy of the Homeowner Handbook at time of contract. In addition to our one-year limited warranty, we have also partnered with an extended warranty provider to offer a ten year structural warranty that adheres to the strictest standards of excellence.